Understanding "Noise" in your Digital Images"
With certain settings on your digital camera, images may be subject to what’s called "noise". "Noise" refers to random, colored pixels. 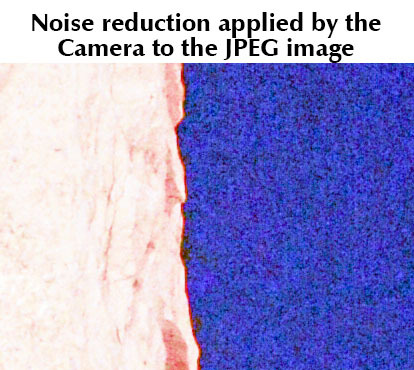 This "noise" degrades the quality of your images. You can’t always avoid "noise", so your digital camera has circuitry in it to help eliminate the noise. This article attempts to help you identify what situations cause noise (which will help you avoid noise in the first place) and what your options are to eliminate the noise in your images when you can't avoid noise. You may have noticed that new digital cameras are introduced at an astonishing rate. In the old "film days", a camera could last you 10 years or more. Advances in the quality of film, meant that nothing really changed in the camera – just in the film you used. However, now, the place where the quality changes isn’t external to the camera (the film), it’s internal – the sensor and the associated electronics. Thus, as camera manufacturers make advances in the quality of the sensors and electronics, new cameras are introduced. For the most part, the quality improvements are in the ability to produce images with less noise. The sensor size impacts noise significantly. Smaller sensors produce MUCH more noise than larger sensors, everything else being equal. Thus, full-frame sensors produce the least noise, and the extra small sensors of the point-and-shoot cameras and cell phones produce a LOT of noise. What situations cause noise in digital images? When you take a picture at very slow shutter speed, the sensor heats up, and the quality of the image degrades. This degradation manifests itself in the form of "noise". Typically, shutter speeds of 1 second or longer can cause noise in an image. Here are two images of the night sky – both taken with long exposures. The image on the left shows some stars, and what "looks" to be lots of faint stars, but in fact, these "faint stars" are nothing more than noise generated by the sensor. The noise is a bit different in the second image, where the noise is more prevalent and shows itself with more color. Due to the long exposure, the stars appear to move, where the noise is stationary. Your digital camera has an option to change the ISO speed. Your camera "appears" to have many ISO speeds. But, in reality, it only has ONE native ISO speed – generally between 50 and 200. In order to achieve higher speeds, your camera amplifies its native ISO speed, much in the way your TV has a volume control that amplifies the audio. You may notice, that if you increase the volume on your TV or stereo too high, that it starts to distort. This is what happens in your camera. As it amplifies the signal that the sensor produces, noise is introduced. Newer cameras and cameras with larger sensors tend to perform this amplification best. 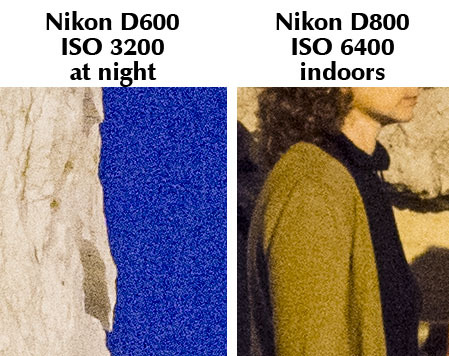 But all cameras introduce noise as the ISO is increased. 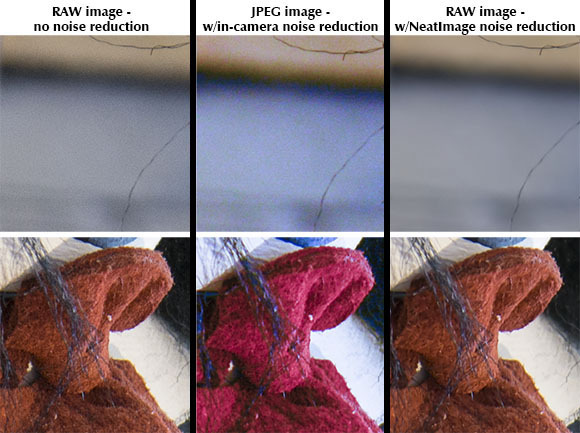 The images below show noise from high ISO speeds – they are both from a small segment in the middle of the frame at 100% with no noise reduction applied. The first image was shot at night of a stone statue against the night sky. The continuous-tone blue night sky shows the noise clearly. In the second image, which was taken indoors at ISO 6400, the noise is most obvious in the continuous tone of the brown jacket. All digital cameras have circuitry in them to help identify and remove noise. 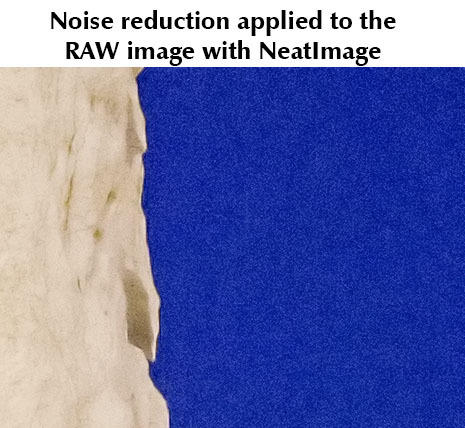 This noise reduction capability only works on JPEG images - RAW images aren’t affected by it. The above images were all from RAW images, where no noise reduction was applied. When Noise Reduction is turned on, it takes more than double the time to take and save the image than it does to take it. Thus, if you take an image with an exposure of 10 seconds, it may take 22 seconds from the time you first press the shutter to when the image is finally saved to your memory card. This becomes painfully apparent with very long exposures – thus a 60 second exposure may take over 2 minutes to take and save. The way that in-camera noise reduction works is that your camera takes a second image for exactly the same duration, ISO speed and aperture without opening the shutter. This "Dark" image will contain only noise on a black background. The camera then "subtracts" the second image from the first, thus removing the noise. That's why it takes just over twice the time to take and save the image, as two images have to be taken. The image below is the JPEG that the camera produced at the same time it produced the RAW image above (I was shooting where the camera was saving BOTH the JPEG and RAW files). It was shot with a high ISO speed. You can see where the camera attempted to smooth out the noise. But, the quality of the JPEG is quite poor (another reason you should consider shooting RAW!). 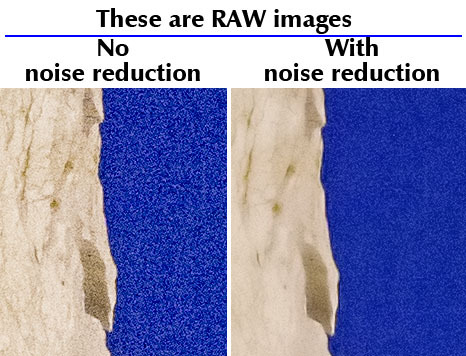 As you can see, noise reduction can dramatically reduce the amount of noise in your images, but, it comes at a cost. It tends to soften the entire image. As you can see in these before and after images, the sky is much better in the processed image, but the stone statue has lost a lot of detail. Here's another example - taken indoors with a Nikon D800 camera with an exposure of f7.1 at ISO 200 with a 25 second shutter speed (the room was farily dark). Let's examine the two areas of the image in blue squares above. One is a continuous tone area (on the left), which would be subject to noise; and the another (in the center) should be sharp. The 2 vertical extracts on the left are from the RAW file without any noise reduction. It shows the most noise in the continuous-tone (gray) area. 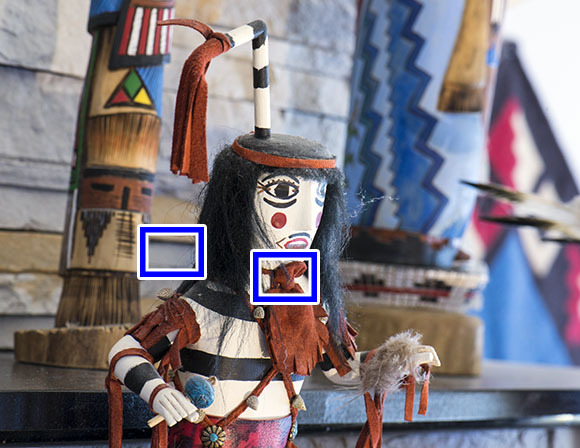 The 2 vertical extracts in the center are from the JPEG, which had in-camera noise reduction applied. The 2 vertical extracts on the right are the same as the images on the left - from the RAW file - but, I applied external noise reduction to these using NeatImage. We can deduce several things about this. The processed RAW file extracts on the right are MUCH superior to the in-camera processed JPEG file - in terms of noise reduction and color, but you can see a very slight reduction in the sharpness. The superior processing power of a desktop computer over the camera, does a much better job. If you’re shooting RAW images or JPEG images with Noise reduction turned off in your camera, then you can use the noise reduction capability of your post-processing program (Photoshop, Elements, Lightroom, etc.). High ISO speeds can be your friend. Yes, high-ISO speeds may cause some noise in your images, but, on the other hand, they can also allow you to shoot in conditions where light is in short supply. I routinely shoot at ISO speeds of 1000 or higher - often at ISO 3200 or higher. Many of the people I talk to and/or teach seem to have an aversion to shooting at hight ISO speeds. But high-ISO speeds produce much less noise in newer cameras, and a little noise is a LOT better than getting a blury image because the camera had to select a very slow shutter speed. Don't be afraid of noise - embrace it when needed. You can also try to avoid noise. The way you would do this is to shoot at the lowest ISO speed that will yield a good image. How do you know what ISO speed to use? Well, that takes a bit of practice, but, if you’re hand-holding your camera, you have to be aware of what shutter speed you’re shooting at. In Program or Aperture Priority shooting modes, your camera decides what shutter speed to use. You need to look at this speed and determine if you can hand-hold your camera at this shutter speed and still get a sharp image (see our eTip here). If the shutter speed is too low, you’ll need to increase the ISO speed. That’s one of the benefits of shooting with a tripod – you don’t have to worry about slow shutter speeds, and can generally shoot at your camera's native ISO speed, thus virtually eliminating noise. Unfortunately, with long exposures, there’s not much you can do to eliminate noise, other than to buy the latest and greatest camera and use a good noise reduction program.